This morning I had my parents and some close friends visit for morning tea, so I decided to make something for them that would use up some of our many lemons! 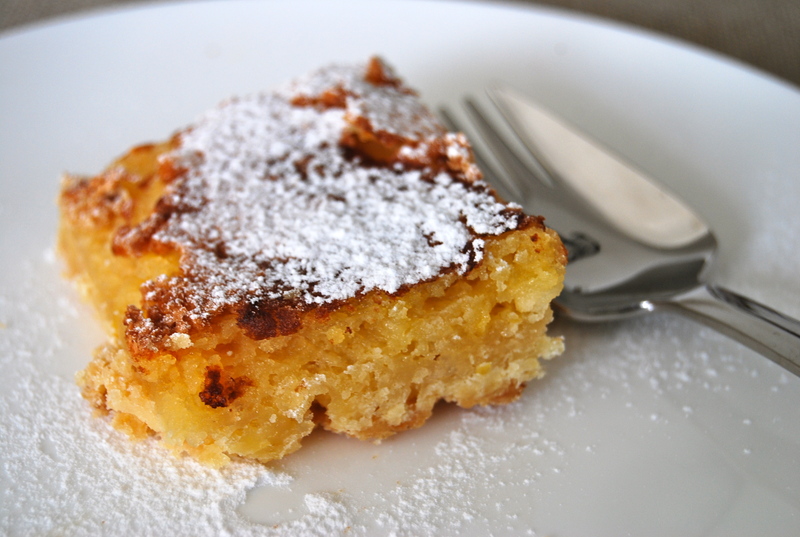 This is a very moreish and moist slice with a squidgy lemon topping. When putting it together ensure the topping is poured onto the hot base as soon as it comes from the oven or it will sink underneath the base! For those who are gluten free, you can replace the flour with Healtheries Simple Baking Mix and it works just as well. Preheat oven to 180°C. Line and grease a standard 20 x 30cm swiss roll tin. Put the first 5 ingredients together into a food processor and process until the mixture forms soft beads of dough. Turn into the prepared tin and press firmly into the base. Even out by rolling a floured glass over the base. Bake in the preheated oven for 12-15 minutes or until lightly golden. While cooking, prepare the topping. Using an electric beater beat the eggs and caster sugar together until light and fluffy. Fold in the grated lemon rind, lemon juice and flour. Pour topping over the hot base. Return to the oven for a further 25 minutes until the topping is spongy, golden and cooked. Allow to cool in th e tin. Dust with icing sugar before serving. Use a hot knife to cut into squares.